Director/Screenplay – Ari Aster, Producers – Kevin Frakes, Lars Knudsen & Buddy Patrick, Photography – Pawel Pogorzelski, Music – Colin Stetson, Visual Effects – Brainstorm Digital (Supervisor – Eran Dinur), Special Effects Supervisor – Ryan Roundy, Prosthetic/Miniature Effects – Applied Arts FX Studio, Inc (Supervisor – Steve Newburn), Production Design – Grace Yun. Production Company – Kevin Frakes-Lars Knudsen/Finch Entertainment/Windy Hill Pictures. It is the funeral of Annie Graham’s mother. Afterwards, Annie settles into her home life with her husband Steve, teenage son Peter and younger daughter Charlie, where she spends her time creating lifelike miniature dioramas for exhibition. Charlie then begins to see things. Peter wants to go to a party to meet a girl he is interested in but Annie insists he takes Charlie with him. At the party, Charlie has an anaphylactic reaction to some cake she eats and Peter is forced to rush her to hospital – only for Charlie, who has her head out the car window trying to gasp air, to be beheaded by a telephone pole. As the family grieves afterwards, Annie buries herself in her work but sees things around the house. She discovers that her mother may have been involved with an occult group. At a grief support group, she befriends Joan, who she later finds was a friend of her mother. Joan suddenly discovers seances and urges Annie to contact Charlie. In holding a seance with the rest of the family, Annie becomes briefly inhabited by Charlie’s spirit. As Annie becomes more disturbed, Peter then starts to see things. Hereditary was a debut film for director/writer Ari Aster. The film did surprisingly well in theatrical release through word of mouth, earning some $79 million worldwide. I sat down to watch Hereditary with some anticipation after the considerable word of mouth buzz that it had accrued. It is an interesting film – almost a really good horror film at times. It is also a highly confusing film where Ari Aster seems to delight in leading you in one direction and then taking abrupt and bewildering dogleg turns onto some other tack. The upshot is that you often don’t quite know what type of film you are watching. The film starts in with the funeral of Toni Collette’s mother and the possible haunting of her youngest child Milly Shapiro in the aftermath. Shapiro is an unusual actor – a child with a mop of carroty hair and a face that looks like she is a forty-year-old, which is something that causes you to be drawn to her. There’s the scene where teenage son Alex Wolff is wanting to head to a party to connect with a girl he is crushing on and is forced to take Shapiro with him, only for her have an allergic reaction to some cake she eats and he to have to rush her to hospital. The abrupt shock comes in the scene where Shapiro struggles to get her head out the window for air, only to be beheaded by a telephone pole. After this considerable jolt, the film then doglegs off to chart the reaction of the family, in particular of Toni Collette and her attempts to deal with the grief. In fact, for a good part of the way in, Hereditary could easily play out as a regular family drama and does not do much to suggest it is a horror film. Nevertheless, this proves to be a wide detour and the film eventually returns to horror movie territory. 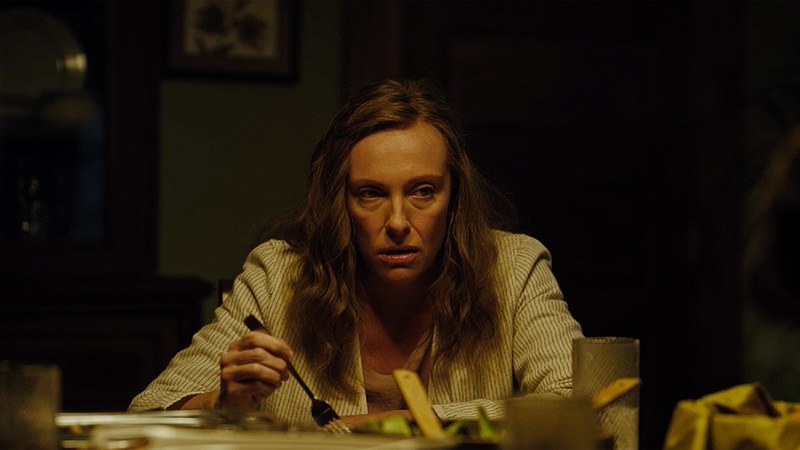 The scene where Toni Collette forces the others to hold a seance and she abruptly starts talking with Milly Shapiro’s voice is a real doozy. One of the standouts aspects of the film is the central performance from Toni Collette. I would be surprised if her name is not floated about come end of year awards season. There are some phenomenal pieces like the scene where she is talking about her feelings at the support group and just lets fly with something enormously raw and naturalistic all in one take. There are a number of other scenes – the confessional at Ann Dowd’s place, the scene where she loses it over the dinner table, the spooky seance scene with the rest of the family – where she does some amazing work. Indeed, it is the women of the show who shine. The other fine performance comes from Ann Dowd, better known of recent as Aunt Lidia in The Handmaid’s Tale (2017– ), full of sympathy and imprecations as the stranger who befriends Toni. By contrast, the second-billed Gabriel Byrne, who also takes a co-producer role (as does Toni Collette), remains in the background and relatively anonymous. This is a film that had the potential to be a great horror film in its hands but equally where the awkward misshapenness of the script causes to fall apart. This is particularly the case at the end where things don’t make a whole lot of sense, even at the same time as they are extremely spooky. [PLOT SPOILERS] Alex Wolff gets up out of bed and there is a considerable jump as a white shape scuttles along the ceiling behind him – a jumpshock undeniably borrowed from The Exorcist III (1990) – but what it is is never explained. He goes downstairs and finds Toni Collette, previously the sympathetic point-of-view character, has now turned maddened and attacks him. In one eerie scene, she jumps up onto the ceiling and batters her head against the barricaded attic door – but again, what changed her like that out of nowhere is unclear. This is a film where its potential is undone by a script that feels excessively complicated. 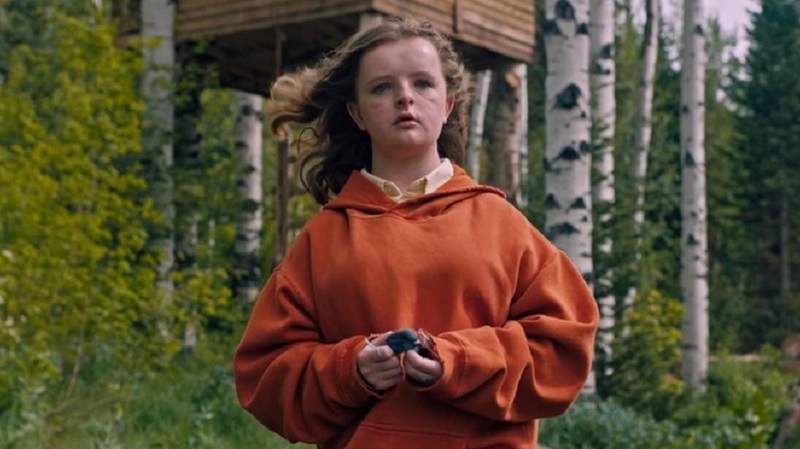 Another more formulaic film would have cut down the long preamble at the start where spooky things seem to be happening to Milly Shapiro as well as given us more explanations about what is going on with the cult. As it is, we get a bunch of things happening that never seem to quite connect – children being haunted, a plot about seances and contacting a dead child, another about ominous things unleashed, before the film eventually decides it is about a cult appointing a Chosen One. How this ties together with the seance aspect is never exactly clear.